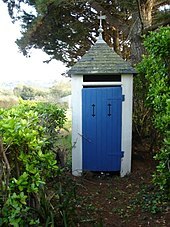 An outhouse is a small building that covers a toilet. The toilet inside is often either a pit latrine or a bucket toilet, but other forms of dry (non-flushing) toilets may be found. ↑ Cary, "Jackpine" Bob (2003). The All-American Outhouse–Stories, Design & Construction (print). Cambridge, MN: Adventure Publications. ISBN 978-1-59193-011-2. This page was last changed on 25 March 2019, at 16:23.